Next postWho Makes the Biggest Difference? In my four years of teaching math, the only fix that I’ve discovered is slow, sometimes painfully so. It is changing the understanding and the perception of the subject. No one would love reading if all they read were random lists of words in the dictionary, though some might have taken pride in their ability to do it fluently. You describe this change throughout your post. If teachers and students see math as full of creativity, imagination, questions to ask, discussions to have, art to bring to life, everything starts shifting and changing. I love reaching this point in the year when every one of my kids participates in the number talks, builds models, constructs mathematical arguments… Some are moving to multiplication and division, decimals and integers operations. Some are still figuring out two digit subtraction and just barely got comfortable with their benchmark of ten. Regardless of their numeracy skills, they use any available tools (symbolic or physical) to engage in mathematical reasoning. This week, one of my students who worked really hard for half a year to figure out addition and subtraction of numbers to 20 (with rekenreks, and 10 frames, and subitizing cards) joined our Splat! warm ups (created by Steve Wyborney). He explained how he convinced his dad that square is, in fact, a rectangle. He noticed, wondered, estimated, measured, calculated, made diagrams to explain his thinking and was cheering to find if his estimate was close. There are a lot of things that I don’t have any fixes for. 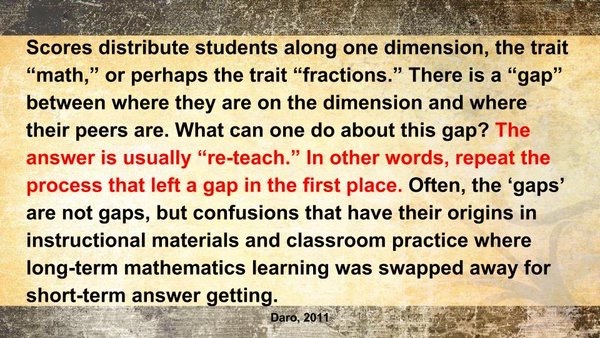 Efficiently addressing numeracy gaps. Giving enough attention to every student. Providing timely feedback. Staying focused on specific learning intentions. You are right, a lot of it is about “what to do next”, and how to prioritize. But I think my slow fix has been working for me. I am learning to teach mathematics as an adventure of human mind that everyone can join. Thanks for sharing. Real change takes time! I think most of us that are on the learning journey are figuring this out as we keep learning. There is no quick fix! There is no silver bullet! Lots of good things to think about here. I recently gave a test on solving one-step equations to my sixth-graders. I basically gave them one way to show the work they are doing with inverse operations. This was not because they couldn’t solve any other way, simply because this is a method that works for all equations, even those that can’t be solved by inspection. However, more importantly, it is a method that will continue to work in seventh-grade when we are solving multi-step equations that cannot be solved by inspection. But, I struggled when I came across a student who told me that 2r=12 means that since 2*6=12 then r = 6. Is that sufficient work? I deemed that it was not, because if you cannot solve by inspection, then where does that 6 come from? Am I simply forcing them to use a system just because it works for me? I don’t know. I do know that the same student said on a different problem that the equation -3x=4 could not be solved. This reinforces my idea that students need a technique for how to solve when inspection doesn’t work. In class we solved with Algebra tiles, we solved by inspection, we solved using cups and counters. We did card sorts. We did a variety of things, but the majority of them involved equations with integral solutions. I would argue that they very time we need a standard algorithm is when we have messy solutions. Also, a standard algorithm gives us a way to communicate with other mathematicians that is efficient and understandable. It gives us a technique to try when we don’t know what else to do. Did it work for every student? No. I’ve never seen anything that worked for everyone. But it did work for 48 of my 51 sixth-graders, and I anticipate that the majority of them will continue to use it next year and beyond. That feels good enough to me. I agree with the first comment — most of your descriptions describe “fixes” which are based on math being this procedural ritual… and I revel in the description of the student who’s using all tools available to *build sense,* not to get answers. Yes, a square being a rectangle 🙂 🙂 🙂 🙂 THat’s a growing mind. I also struggle w/ the ‘by inspection’ to algorithm path… I think most materials, in their desire to get students past intuitive inspection, leap too quickly into examples to which students don’t assign sense (reducing 17/51 is one…) Using language and manipulatives — and more than once, for crying out loud! — to help students construct that understanding so that they can explore the ‘harder’ questions and make sense of them is … yea, it’s a slow fix. There’s also a *real* danger of giving students those “challenge” problems where we would like to *think* they are engaging in rich reasoning. I’ve had students come down to me anxious or angry about that and rightfully so. To them, it was as if the problems were delivered in a foreign language — the struggle is not always constructive. Thanks for sharing your thoughts. Hopefully my statement of “not worrying” about facts wasn’t taken as not worrying about number sense. I completely believe we need to help our students develop their math fluency (flexibility), but I’m not sure memorizing is how this is done. And your comment about “challenge problems” is right on! Handing out work that is not developmentally appropriate isn’t helpful at all. We need to make sure we are asking our students to do tasks / activities / problems that allow them to access their prior knowledge and use their reasoning skills to make sense of things. Again, we need to continue to learn more about what is developmentally appropriate to know what our students’ next steps are.